Dual threat life saver. Broad Stem Cell Research Center scientist Andrew Goldstein researches new treatments for prostate cancer and also serves as an advocate for anti-bullying, especially for LGBT youth. UCLA stem cell researcher Andrew Goldstein was eating lunch in Westwood Village last March when he received an email on his phone with the subject line “Hoping you can help us out ...” It was from the father of a lacrosse-obsessed 12-year-old boy whom had recently come out as gay to friends and family but who was struggling emotionally. Scott Lange remembered that years ago ESPN did a story about when Goldstein came out to his Dartmouth lacrosse teammaes, and wrote that his son, Braeden, had become isolated and even hinted at taking his own life. Lange wondered if Goldstein could send some sort of supportive message to his son. So Goldstein made a video for Braeden in which he told him that he was the “bravest kid I’ve ever heard of.” Knowing Braeden was a lacrosse player he then asked several other gay lacrosse players to make videos for Braeden, too, and he also sent Braeden the helmet from his days playing professional lacrosse for the Long Island Lizards. ESPN did its first story on Goldstein 10 years ago, a couple of years after he came out to his Dartmouth College lacrosse teammates. In 2003, Goldstein’s Dartmouth lacrosse team had had a breakout year. They had the most victories in school history, won a share of the Ivy League championship and earned Dartmouth’s first NCAA tournament appearance. Even though Goldstein earned All-America honors that season, he still felt like he couldn’t play his best while keeping a big part of his life secret. But there were no openly gay team sport athletes to look up to. Goldstein said that he wanted to come out to his teammates but he worried about their reactions. At the time the first ESPN story aired in 2005, Goldstein was named the most accomplished male team sport athlete in North America to be openly gay while competing. That same year, he was named to the “OUT 100” list by Out Magazine. Though Goldstein’s teammates were incredibly supportive, Braeden’s friends, classmates and teammates had mixed reactions, Goldstein said. Braeden was feeling isolated and was thinking about suicide. That’s when Braeden’s father remembered the ESPN story on Goldstein and found his email address online. Goldstein’s friendship and support over the next few months changed Braeden’s life, making him feel confident and unstoppable. 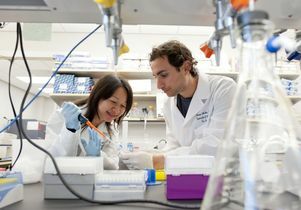 Goldstein, 32, is now married to husband Jamie Duneier and enjoying a successful scientific research career at UCLA. As an assistant researcher in the departments of molecular and medical pharmacology and the urology, Goldstein is working to find new treatments for castration-resistant prostate cancer, the most advanced stage of the disease. Guided by the mentorship of physician-scientist Dr. Owen Witte, professor of microbiology, immunology and molecular genetics at UCLA and director of the Broad Stem Cell Research Center, Goldstein was the first author of a study that identified the cells in which prostate cancer originates. The research, which garnered considerable media coverage, was published in the prestigious journal Science in 2010, a substantial achievement for a graduate student. Goldstein, who is also a member of the UCLA Jonsson Comprehensive Cancer Center, completed his Ph.D. at UCLA in molecular biology in 2011. His research focuses on identifying and understanding the prostate cancer stem cells that are able to survive, self-renew and generate cancer in prostate tissue. Through understanding how these cells work, Goldstein hopes to find new targeted treatments that stop their progression towards cancer. In addition to his professional accomplishments, Goldstein is actively involved in the You Can Play Project, which is dedicated to ensuring equality, respect and safety for all athletes, without regard to sexual orientation. He continues to speak with students, athletes and coaches at numerous venues around North America. Through this work, he inspires more young people like Braeden and athletes of all ages to live their truth with pride.